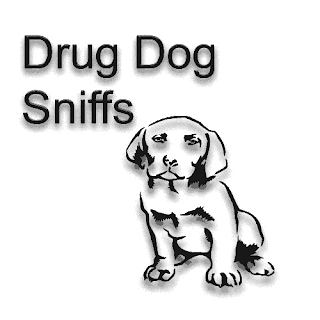 How accurate must a drug sniffing dog be? Courts have frequently addressed drug dogs and drug dog training to evaluate whether the indication of drugs during a walk-around is sufficient to justify a complete search. One court ruled that even though 46 percent of the time, the dog was wrong, that poses no problem to the nearly half of citizens detained and searched with no drugs found. Cops use dogs to detect many things other than drugs. Sniffing dogs can also detect bombs, blood, and bodies. Drugs are the most profitable use of these furry friends, since forfeiture of vehicles and cash can follow a drug seizure. Dogs can be trained to detect methamphetamine, marijuana, cocaine, heroin, and ecstasy. 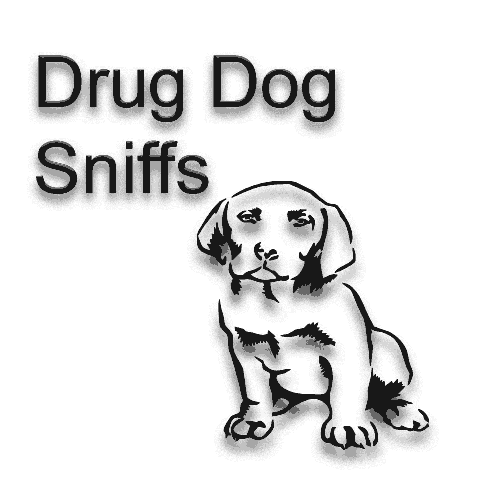 The dog sniff can provide probable cause to search a vehicle, property, a home or arrest a person. Some Judges have expressed concern, but convictions are supported even where, "overall accuracy rate in the field (i.e., the number of times he alerts and his human handler finds drugs) is not much better than a coin flip (59.5%)." US v Bentley, No. 10-10108-001 (7th Cir 2015). How do they grade a drug dog, drug sniffing dogs, in drug sniffing dog training, and drug dog accuracy, at the Canine Training Institute? Drug dog success rates in training and on the streets are available. Most agencies maintain training logs and search logs reflecting the accuracy of anti drug dogs. The dog does not need to graduate at the top of the class to hit the streets of America. Even where a dog trained by the Canine Training Institute (CTI) is merely a "lucky dog" with a less than perfect accuracy rate, police continue to use the animals. Dog trainers at CTI do not calculate class rank and a dog in Illinois, who would have been at the bottom of his class (if the Institute had rated performance) has been supported by both law enforcement officers, prosecutors, trial courts, and federal appeals courts. Police drug dogs continue to be the subject of both state and federal court review. The training and testing consists of "simulated vehicle searches. . . . . [With rewards] every time the dog alerts in the field. Presumably the dog knows he will get a “giftee” (a rubber hose stuffed with a sock) every time he alerts." How does the United States Supreme Court rule on Drug detection dogs? The United States Supreme Court’s decision is Florida v. Harris, 133 S. Ct. 1050 (2013). That case overruled Florida's checklist for reviewing canine search accuracy claims by defendants. A summary of the Harris case in the Florida Supreme Court is here: http://www.drug2go.com/2012/03/drug-defense-attorney-drug-dog-sniffs.html . In that case, the Florida Supreme Court noted, "a drug-detection dog has been trained and certified to detect narcotics, standing alone, is not sufficient to demonstrate the reliability of the dog. To demonstrate that an officer has a reasonable basis for believing that an alert by a drug-detection dog is sufficiently reliable to provide probable cause to search, the State must present evidence of the dog's training and certification records, an explanation of the meaning of the particular training and certification, field performance records (including any unverified alerts), and evidence concerning the experience and training of the officer handling the dog, as well as any other objective evidence known to the officer about the dog's reliability." What happened to a Florida Drug Sniffing Dog Search in the United States Supreme Court drug dog Case? The United States Supreme Court overruled Florida and found that, "Such inaccuracies do not taint records of a dog’s performance in standard training and certification settings, making that performance a better measure of a dog’s reliability. Field records may sometimes be relevant, but the court should evaluate all the evidence and should not prescribe an inflexible set of requirements. " In the Florida case the dog had been trained to detect "methamphetamine, marijuana, cocaine, heroin, and ecstasy).